He isn't tight. Not one of those blokes who's first out the cab but last to the bar. He loves a bargain, is all. 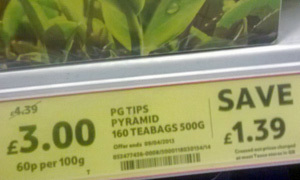 Box of 160 pyramid teabags down from £4.39 to £3.00. And they're the brand she likes. He feeds in the note, pockets the £2 coin. Unlocks his bike and sails off to locate the next loss leader. Doesn't hear the cashier racing out with his forgotten fiver.